I’ve made no secret about the fact that chess pies are the greatest pies that exist. I mean sure, almost nothing beats a good apple pie and mountain pie is my special birthday treat, but as a category, chess pies rule. For one, they’re versatile. You can make anything from a Tarheel Pie to the Baltimore Bomb to a vinegar pie and they all fall into the same category. Like cousins in an incredibly tasty family. Secondly, they’re a dying art. Growing concern about sugar and fat consumption makes people vary wary of chess pies, meaning you don’t find them as often as you once could. To this I say- everything in moderation and long live the chess pie. This month, as an homage to National Pie Month and National Sweet Potato Month, and as the Nash County installation of Tasting North Carolina, I’d like to share the recipe for sweet potato chess pie. 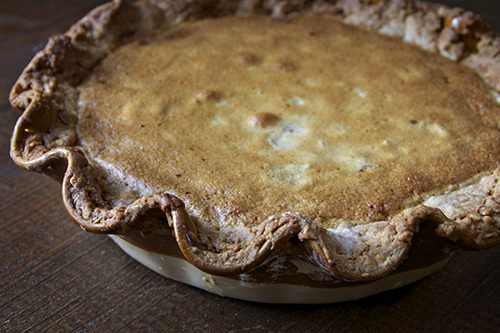 A light and soft pie, this chess is a delicate variation of a traditional sweet potato pie. With only one cup of mashed sweet potatoes, as opposed to four to six in a classic sweet potato pie, it has all of the sweet potato flavor with none of the density. And lest you think “sweet potatoes are for Thanksgiving!” I’ll assure you that I had no problem gobbling up my (much more than a sliver) slice last night, late February date on the calendar and all. 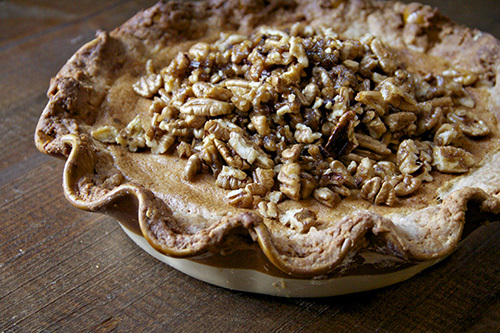 I topped the pie with freshly shelled pecans that had been caramelized with butter, brown sugar, and spices. I’ll admit, the pecans on top and the cinnamon in the crust put this pie over the edge, from “pretty delicious” to “holy sugar high I’m going to eat this whole thing in one sitting.” I’m currently playing the “if I have just a sliver it doesn’t count” game, which, when you have about 100 “just a slivers,” quickly becomes girl you just ate a whole pie. Which is all to say, make this for company. I chose this pie as the recipe representing Nash county, which is located in the Northeastern part of the piedmont between Franklin, Wake, Edgecombe, and Wilson, because Nash county is the largest producer of sweet potatoes in North Carolina, and North Carolina is the largest sweet potato producing state in the country (and has been since the 1970s), accounting for 50% of the country’s sweet potatoes. 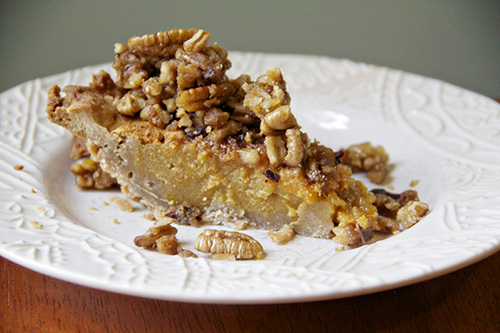 So, if you decide to make this pie, chances are good you’re enjoying a NC sweet potato, probably even a Nash County gem. Nash County is named for the American Revolutionary War Brigadier General Francis Nash, who was mortally wounded at the Battle of Germantown in 1777, the year Nash County was formed. Of Nash county’s many townships, I have the most personal connection to Rocky Mount, where a fair amount of Rosemond-side relatives reside. My most vibrant memory of Rocky Mount was a childhood Christmas visit where my brother Reid (maybe aged 5 or 6 at the time) recited the infamous Home Alone line “Merry Christmas, you filthy animal” to my Great Aunt Francis. She did not get the reference and my family still jokes about that moment and the horrified look on her face. Reid has always been good with impressions. I wanted to take a moment to thank all of you for the generous outpouring of support and interest in Tasting North Carolina. Since I launched the project a few weeks ago I’ve received countless emails, phone calls, and letters about recipes from all over the state and inquiries about how this community can get involved. I am psyched to make all of these delicious foods and I thank you for trusting me with your stories and your recipes. One thing is overwhelmingly clear- North Carolinians love this place and we’re fiercely proud of our food culture. Thank you. I’m prouder than ever to call myself a North Carolinian. 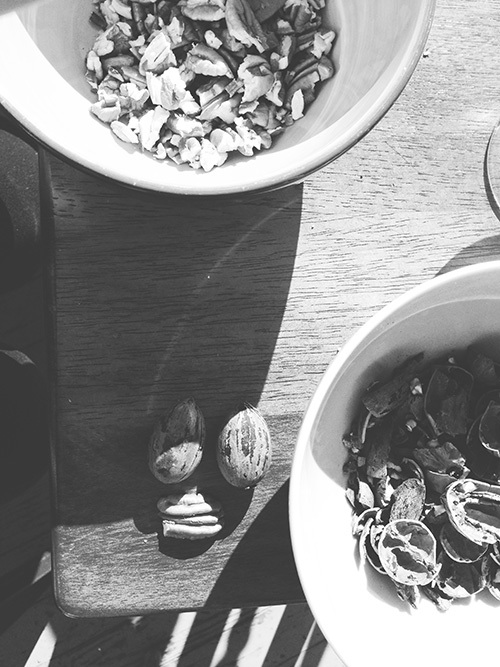 This post is part of the ongoing series, Tasting North Carolina. Read more about the project here. Start with your pie dough, about 2 hours before you plan on making your pie. Stir together sugar, flour, and cinnamon. Work in shortening with your hands. Cube butter and work that in until the consistency is like cornmeal or sand. Stir in water until a ball forms, then wrap the ball in plastic wrap and refrigerate for at least an hour. 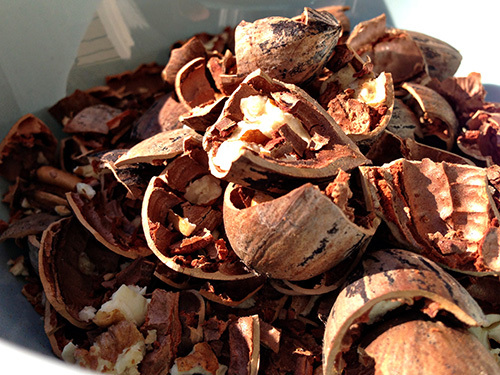 Peel and boil your sweet potatoes until soft. Combine in a mixer with remaining ingredients and blend until smooth and fluffy. Heat your oven to 350 and press your pie dough into your pie pan. Pour in filling and bake for 40 minutes or until the top has browned. Let cool until solid. 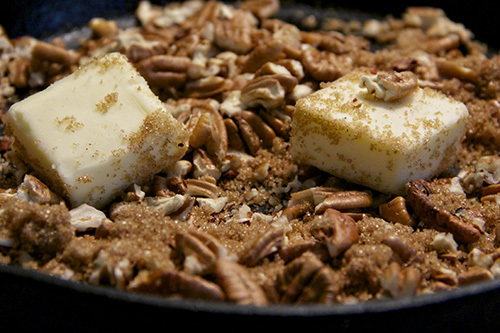 Combine pecans, butter, and sugar in a skillet and cook over low heat until caramelized. 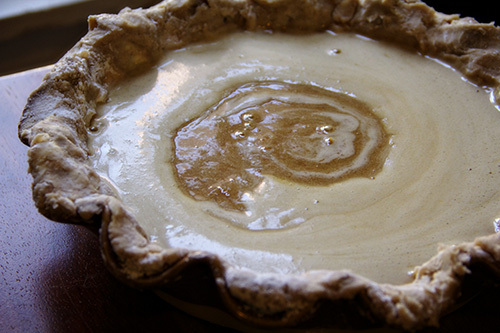 Slather on top of the pie and give it all about an hour to settle. 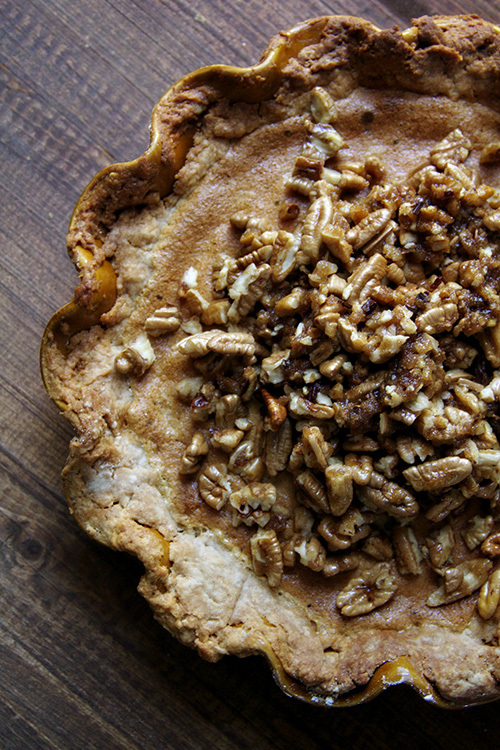 This pie is best served at room temperature. This looks absolutely delicious and is something I am going to try myself. Thanks for sharing.